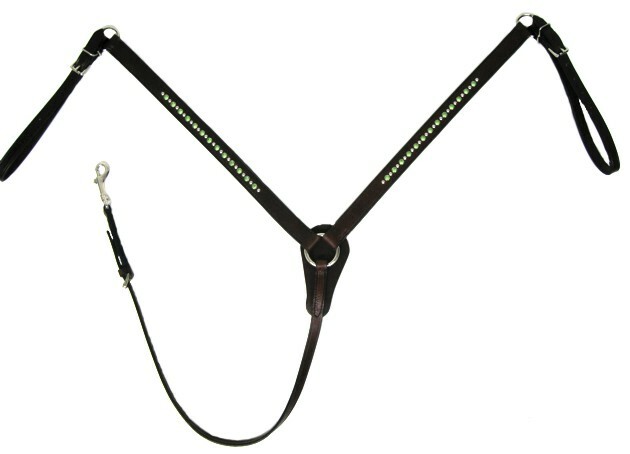 This breast collar is made in the U.S.A using high quality bridle leather and superior hardware. Available in Light Oil, Havanna Sunset, or Black. Accented with real Swarovski crystals and Chrome-plated studs. Crystal colors: clear, AB, pink, light blue, peridot (light green), emerald green, ruby red, amethyst (dark purple), tanzanite (light purple), saphire blue, volcano (mulit-color).